Well Miss Winter rearer her ugly head late last week, and decided she was gonna stick around for a bit. Well I stuck my metaphorical tongue out and went sandal shopping! I am craving simple leather sandals for summer. I'll take one of each of these, please!!!! I'm probably the first one thinking about sandals....unless you are lucky and have a vacation to somewhere warm coming up! 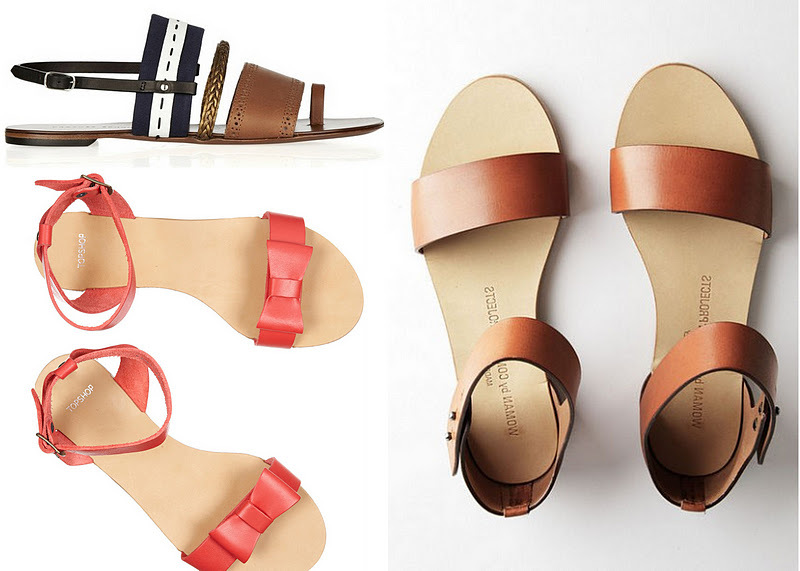 Those brown leather ones are the perfect everyday sandal, flat and chic. And those bow ones are so so pretty! I absolutely love those Topshop sandals and I'm officially ready for spring to be here. For serious. Those topshop's are adorable with the bows! Sandals are on my mind year round in Florida ;) The coral ones with the bow are so cute! I'll take the bow sandals please. Stunning. I did most clothing made nowadays s way too detailed. I like simplicity in bright colours like these! I'm with you -- I'm over this whole winter thing. I love these pretty, simple sandals! We just booked a trip to Florida for March - you can bet my shopping carts are all full of summer clothes, sandals included! ixnay on winter. bring on the sandals!! I can't wait to wear sandals again. I will be counting the days. I'm thinking about sandals too and these are fab!!! Love the PS ones..